Honest Judge, i Was Framed! Fall and all the trees make quite a mess. It's better to keep the leaves out in the first place. The frame was made of two 3/4" PVC pipes joined with a union and then tied with rope to make a more ridgid frame. 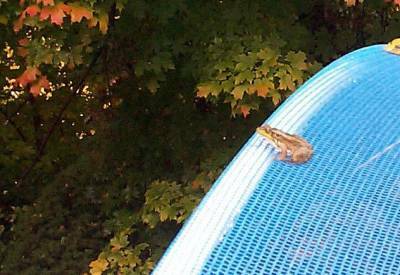 The net is a swimming pool leaf net we got at Leslie Pools. 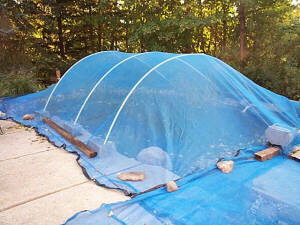 First we put the pond on the 'Net, then we put the net on the pond. The lower pix show how the many. many frogs got to surf the net. The "Scarecrow" was purchased at a local gardening store. 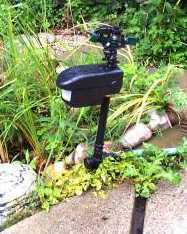 It uses a 9 volt battery and a waterhose to make a motion sensor impulse sprinkler. When a heat source moves in the protected area, the sprinkler goes off for 3 seconds and then rests for 8 seconds. If there's further movement it goes off again. The sensitivity is adjustable. We bought this to keep away the blue heron. It works very well on Dottie too.